This is a list of Bohemian monarchs now also referred to as list of Czech monarchs who ruled as Dukes and Kings of Bohemia. The Duchy of Bohemia was established in 870 and raised to the Kingdom of Bohemia in 1212 (although several Bohemian monarchs ruled as non-hereditary Kings of Bohemia beforehand, first gaining the title in 1085). From 1004 to 1806, Bohemia was part of the Holy Roman Empire, and its ruler was an elector. During 1526–1804 the Kingdom of Bohemia, together with the other lands of the Bohemian Crown, had been ruled under a personal union as part of the Habsburg Monarchy. From 1804 to 1918, Bohemia had been part of the Empire of Austria, which itself had been part of the dual monarchy of Austria-Hungary from 1867 to 1918. Following the dissolution of the monarchy, the Bohemian lands, now also referred to as Czech lands, became part of Czechoslovakia, and form today's Czech Republic (Czechia) since 1993. Spytihněv I 894–915 Son of Bořivoj I. 915–921 Brother of Spytihněv I. 935–972 Brother of Wenceslaus I. (Boleslav II. Pobožný) 972–999 Son of Boleslaus I. (Boleslav III. Ryšavý) 999–1002 Son of Boleslaus II. Jaromír 1004–1012 Brother of Boleslaus III. Spytihněv II 1055–1061 Son of Bretislaus I. (Vratislav II.) 1061–1092 Brother of Spytihněv II. King 1085–1092 as Vratislaus I. (Konrád I. Brněnský) 1092 Brother of Vratislavus II. (Břetislav II.) 1092–1100 Nephew of Conrad I, son of Vratislav II. Bořivoj II 1101–1107 Brother of Bretislaus II. (Svatopluk Olomoucký) 1107–1109 First cousin of Bořivoj II. Vladislaus I (Vladislav I.) 1109–1117 Brother of Bořivoj II. Soběslav I 1125–1140 Brother of Vladislaus I. (Vladislav II.) 1140–1172 Nephew of Sobeslaus I, son of Duke Vladislaus I. King 1158–1172 as Vladislaus I.
Frederick (Bedřich) 1172–1173 Son of Vladislaus II. Soběslav II 1173–1178 First cousin once removed of Frederick, Son of Sobeslaus I. (Konrád II. Ota) 1189–1191 Descendant of Conrad I. (Václav II.) 1191–1192 Brother of Sobeslaus II. Ottokar I (Přemysl I. Otakar) 1192–1193 Son of Vladislaus II. (Jindřich Břetislav) 1193–1197 First cousin of Ottokar I. (Vladislav Jindřich) 1197 Brother of Ottokar I.
Ottokar I 1197–1198 Second time. Became king in 1198, and his descendants retained the title. (Vratislav II.) 1085–1092 First King of Bohemia as of 15 June 1085. He ruled as Vratislaus I. under non-hereditary royal title. (Václav I.) 1230–1253 Son of Ottokar I. (Přemysl II. Otakar) 1253–1278 Son of Wenceslaus I. Also Duke of Austria, Duke of Styria, Duke of Carinthia and Duke of Carniola. (Václav II.) 1278–1305 Son of Ottokar II. Also Duke of Kraków (from 1291) and King of Poland (1300–1305). (Václav III.) 1305–1306 Son of Wenceslaus II. Uncrowned (as Bohemian king). Also King of Hungary (1301–1305) and King of Poland. (Jindřich Korutanský) 1306 Meinhardiner. Son-in-law of Wenceslaus II. Non-crowned. (Rudolf I.) 1306–1307 Habsburg. Second husband of Elisabeth Richeza of Poland, widow of Wenceslaus II. Non-crowned. (Jan Lucemburský) 1310–1346 Son-in-law of Wenceslaus II. (Karel I.) 1346–1378 Son of John. Also Holy Roman Emperor as Charles IV. (Václav IV.) 1378–1419 Son of Charles IV. Also King of the Romans until 1400. (Zikmund) 1419–1437 Brother of Wenceslaus IV. Ruled effective 1436–1437 only (because of the Hussite Revolution). Also Holy Roman Emperor and King of Hungary. (Albrecht Habsburský) 1437–1439 Son-in-law of Sigismund. Also King of the Romans and of Hungary. 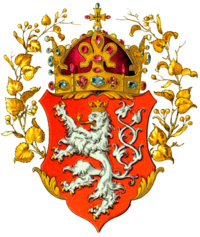 Interregnum 1440–1453 The succession of Albert's son was not recognized by the Czech nobility for the most of this era; the land was administered by the Landfrieden (provincial & territorial). (Ladislav Pohrobek) 1453–1457 Son of Albert born after his father's death. Also King of Hungary. (Jiří z Poděbrad) 1457–1471 Elected king from the Czech noble family House of Kunštát. Although he had descendants, the succession devolved to the prince from Polish kingdom. (Matyáš Korvín) 1469–1490 King of Hungary, elected by the insurgent Catholic Czech aristocrats as anti-king in 1469, but never crowned. In 1479, he agreed to limit his rule to Moravia, Silesia, and Lusatia, while retaining his title. (Vladislav II. Jagellonský) 1471–1516 Nephew of Ladislaus the Posthumous; elected on request of his predecessor George. Also King of Hungary after 1490. (Ludvík Jagellonský) 1516–1526 Son of Vladislaus II. Also King of Hungary. Ferdinand I 1526–1564 Brother-in-law of Louis; elected king. Also King of Hungary and Holy Roman Emperor-elect from 1558. (Maxmilián I.) 1564–1576 Son of Ferdinand I, grandson of Vladislaus II. Also King of Hungary and Holy Roman Emperor. (Rudolf II.) 1576–1611 Son of Maximilian I. Also King of Hungary and Holy Roman Emperor. (Matyáš) 1611–1619 Brother of Rudolph II. Also King of Hungary and Holy Roman Emperor. Ferdinand II 1619–1637 Cousin of Matthias. Also King of Hungary and Holy Roman Emperor. (Fridrich I.) 1619–1620 Elected by the Crown's Estates at the beginning of the Thirty Years' War but after the lost Battle of White Mountain he fled the country. Ferdinand III 1637–1657 Son of Ferdinand II. Also King of Hungary and Holy Roman Emperor.From this time on, Bohemia no longer has an Elective Monarchy, with the Habsburgs having imposed their exclusive rule at the Battle of the White Mountain. Ferdinand IV 1646–1654 Son of Ferdinand III. Junior co-monarch during his father's reign. Also King of Hungary and King of the Romans. Leopold I 1657–1705 Brother of Ferdinand IV. Also King of Hungary and Holy Roman Emperor. (Josef I.) 1705–1711 Son of Leopold I. Also King of Hungary and Holy Roman Emperor. (Karel II.) 1711–1740 Brother of Joseph I. Also King of Hungary and Holy Roman Emperor as Charles VI. (Marie Terezie) 1740–1780 Daughter of Charles II. Also Queen of Hungary. (Karel Albrecht) 1741–1743 Son-in-law of Joseph I. Anti-king to Maria Theresa during the War of the Austrian Succession. Also Holy Roman Emperor as Charles VII. (Josef II.) 1780–1790 Son of Maria Theresa. Also King of Hungary and Holy Roman Emperor. Leopold II 1790–1792 Brother of Joseph II. Also King of Hungary and Holy Roman Emperor. (František I.) 1792–1835 Son of Leopold II. Also King of Hungary, Holy Roman Emperor to 1806, Emperor of Austria from 1804. Ferdinand V 1835–1848 Son of Francis I. Also Emperor of Austria and King of Hungary. Last crowned King of Bohemia. Forced to abdicate during the Revolution of 1848. (František Josef I.) 1848–1916 Nephew of Ferdinand V. Also Emperor of Austria and King of Hungary. (Karel III.) 1916–1918 Grandnephew of Francis Joseph I. Also Emperor of Austria and King of Hungary. Ruled briefly during World War I, in November 1918 renounced participation in state affairs but did not abdicate.